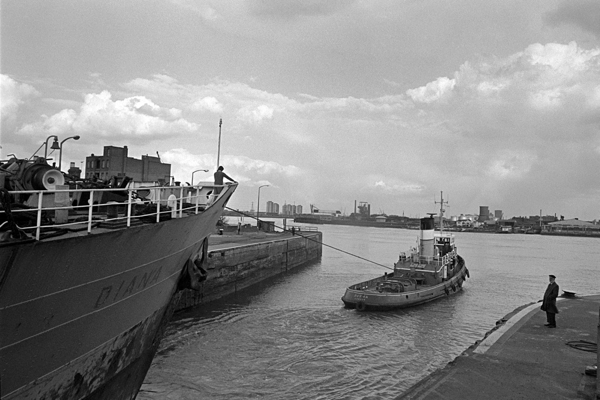 Photographer Tony Bock took these pictures of the dockland – published here for the first time today – between 1973 and 1978, when he worked on the East London Advertiser and lived in Wapping. Subsequently, he returned to Canada where he had been brought up and, for more than thirty years, enjoyed a career as a leading photojournalist on the Toronto Star. Yet Tony’s mother’s family had originated in the East End, and the pictures he took here comprise both an important testimony of a vanished era and the record of one photographer’s search for his roots. “Although the Thames is such a fundamental part of London’s history, in my time it was difficult to get access to it. In East London, every foot was lined by warehouses and industry which meant there were few places I could peer into the life of the river. And the docks were surrounded by high walls, some even inspired by prison walls. The goods being handled were often fragrant, exotic and valuable, both to the importers and the Chancellor of the Exchequer. So accessing the water was often a challenge. The seventies were a sad time. Starting upriver, the docks, wharves and warehouses were closing. 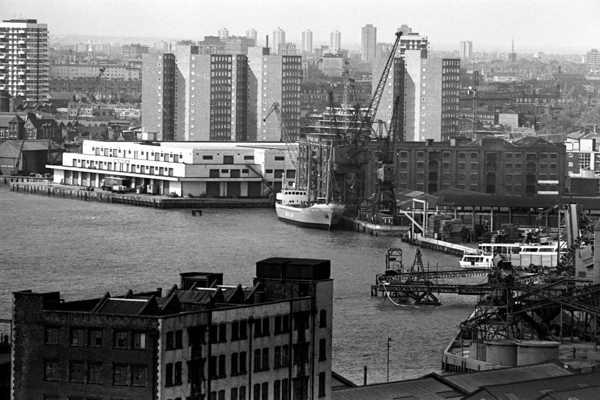 St. Katherine, London and East India Docks were old, small and inefficient, and they had closed in the sixties. 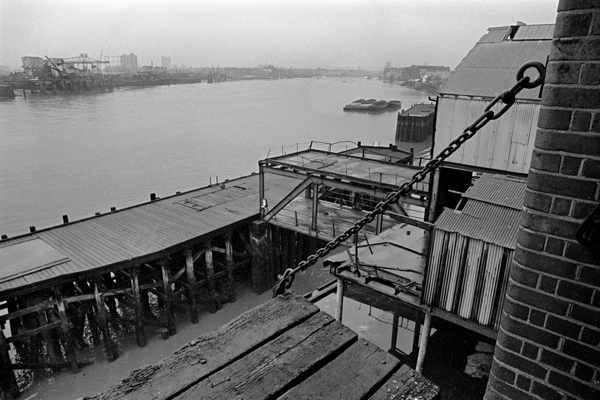 The Surrey Commercial Docks in Rotherhithe did not last any longer, and by the mid-seventies the West India and Millwall Docks on the Isle of Dogs and the Royals in Newham were just hanging on. They could only handle open-hold ships and there were fewer of them calling, by then most shipping had been containerized and moved downriver to Tilbury. And, as the dockers and rivermen moved or lost their jobs, there was a noticeable effect upon the old communities along the river. There were still some barges being towed. 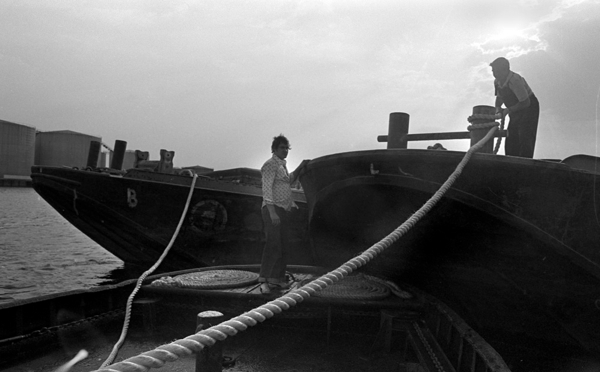 A friend, Don Able, was a tug boat skipper who let me accompany his crew, delivering barges six at a time, to a cement works upriver. Don was a big advocate of shipping freight on the river and avoiding the traffic jams on the A13. Wapping was changing too. 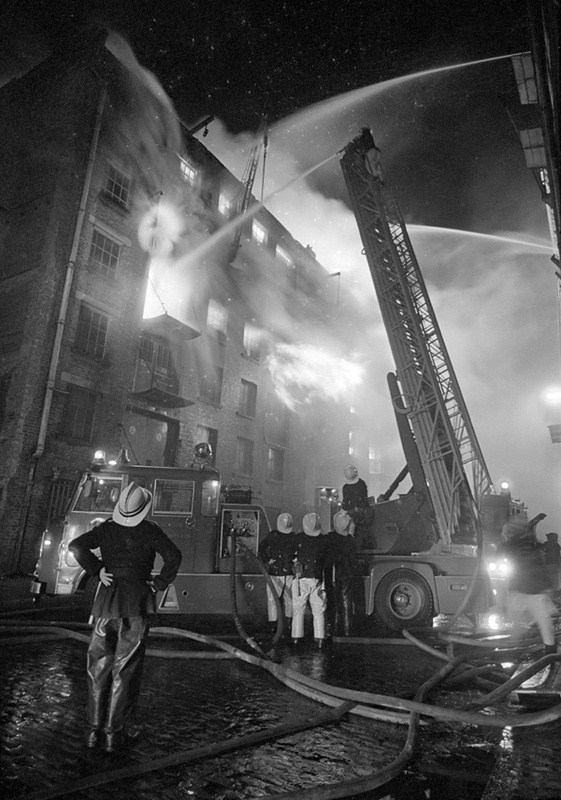 The warehouses, built overhanging Wapping High St, looked just as they had for years but then there was an epidemic of fires – usually in the dead of night – and many of the finest nineteenth century riverside buildings were destroyed in scenes reminiscent of the Blitz. 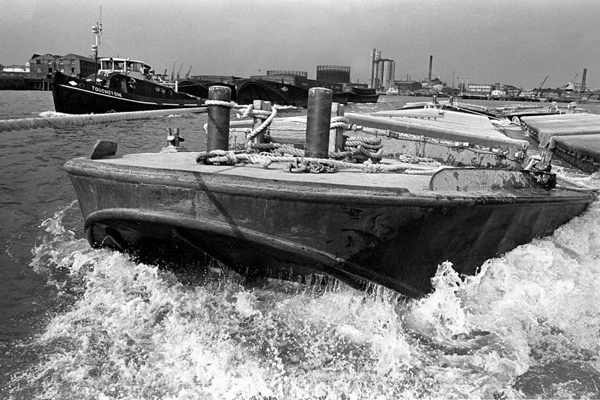 One of the last open-hold vessels to visit West India Dock. Royal Dock on a winter’s day. Heading downriver from West India Dock. 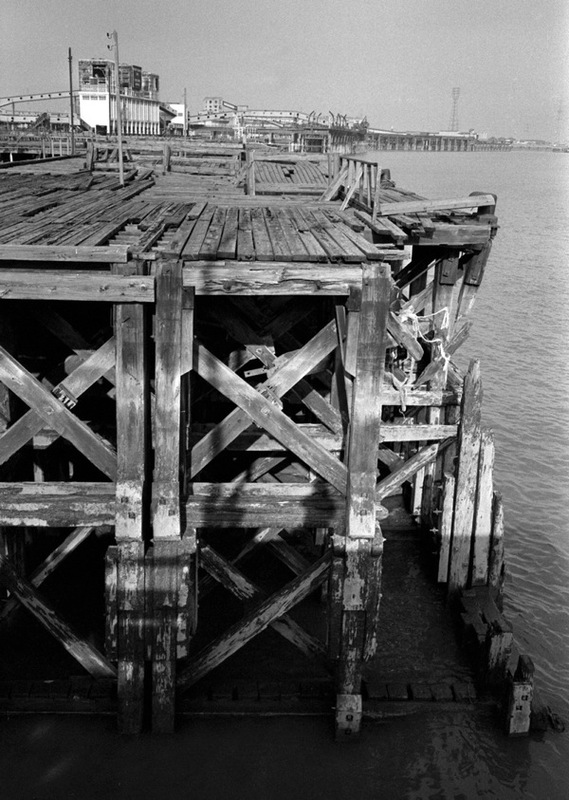 View from the abandoned Free Trade Wharf. Barges hauled through East London. 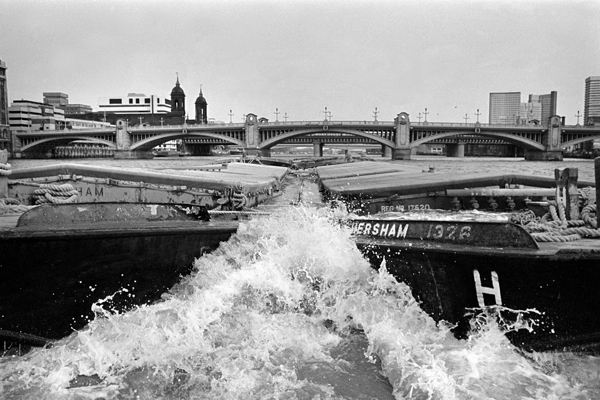 Barges hauled through Central London. New and old buildings in Limehouse. Firemen watch as yet another warehouse succumbs to fire in the middle of the night. 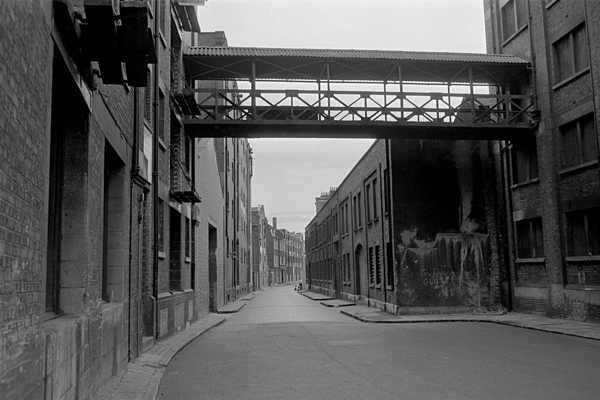 Wapping High St, deserted early on a Saturday morning. 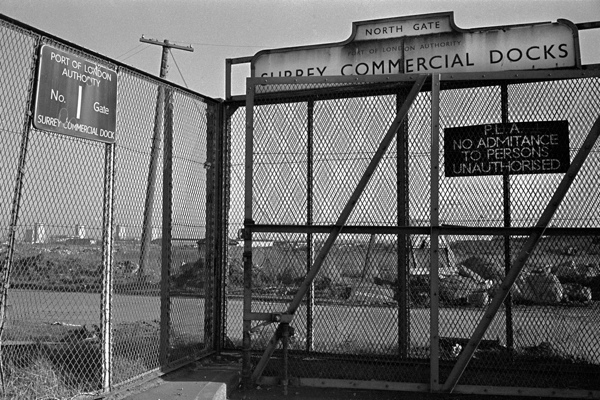 All that was left of Surrey Commercial Docks after the basins had been filled in. 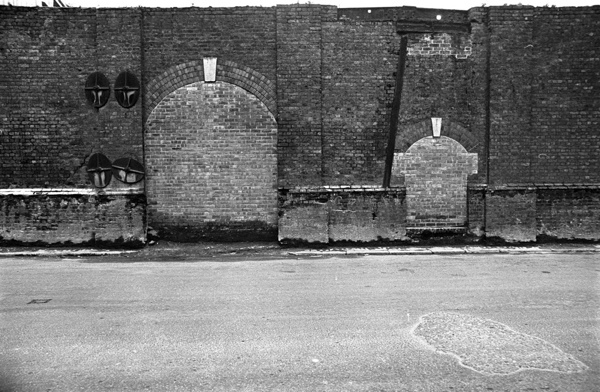 Old warehouses at Wapping Wall. 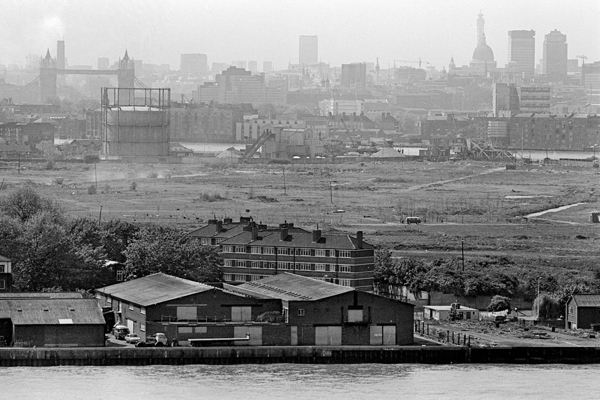 View from Isle of Dogs towards the City. More great photos from Tony Bock – let’s hope there are many more to come! 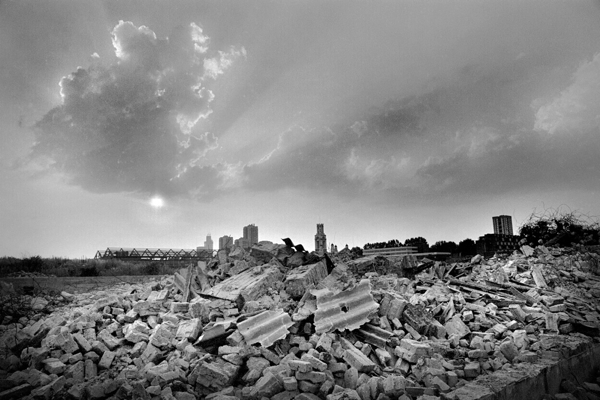 The last photo is almost surreal with a scene of derelict land in close proximity to Tower Bridge and the City. It emphasises how recent it is that City workers have looked to the east of the City as an area fit for encroaching into and even living. The barges are a nice reminder of growing up in Putney. At times they seemed to be non-stop, one after the other. I moved away from the river in 1961 so I never witnessed the decline. But as a teenager would I have noticed? 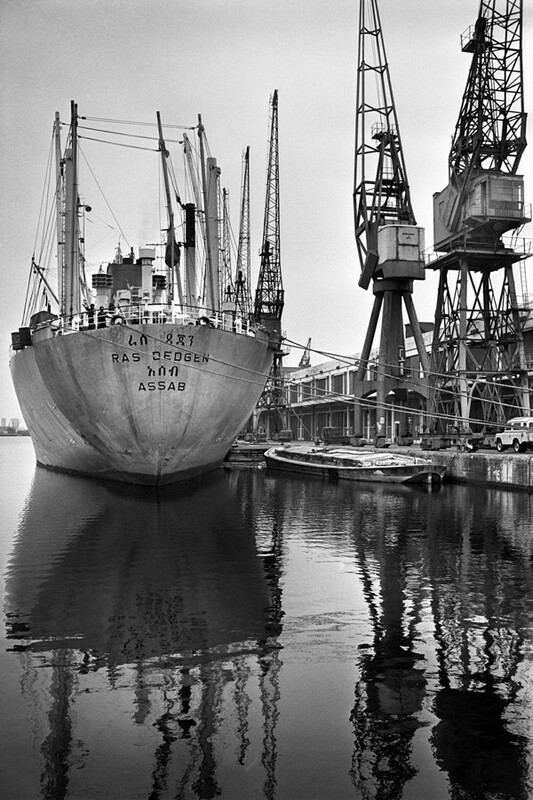 Wonderful pictures about an area of London that interests me: The Docks. Do you have more information about what the Docks were like in 1890? I’d be interested to know more, especially about Tilbury Dock. Anything you can tell me about the area around Tilbury Dock. Thanks. Wonderful pictures. The present series of Call the Midwife depicts quite well IMO the area in the 50s when the docks were still in use. One of my first neighbour in East London, Mrs Wiggins, lost her son to an accident in the docks. He had to be there every morning by 5AM not garanteed a job as only a certain number would be called to unload ships when and if necessary. She had lived her entire live round Bethnal Green being the first occupant of newly built social housing, on the site of an old work house near Regent’s canal. She had become the rent collector of the dwellings during the war and appeared very proud of the responsability. She talked of the West End as if another world. I doubt she’d been west more than a couple of times in her whole life’s time. She totally refused to move in with her daughter in Oxfordshire when things got too hard for her and she felt lonely and abandonned with all old neighbours moved away and not knowing who to trust amongst the new comers. Sadly she was mugged and declined very quickly thereafter. 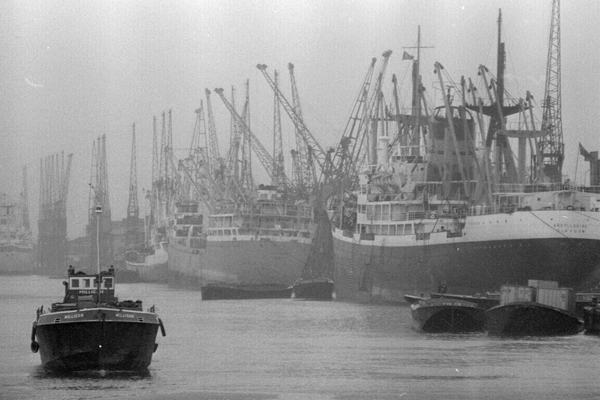 The lives of the docks she used to talk about was a big mystery to me, one of the newcomer in the area in the early 70s to train at the London not yet Royal.